What was that? is this post high or something? Relax, because you’re in for a treat. it’s even better if you’re a Star Wars fan. If you thought the earlier post on old Empire Strikes Back-era footage was intoxicating, wait until you feast thyne eyes on this weird video that landed on Youtube recently. It has already garnered almost half a million views (and counting) with attendant inane comments. 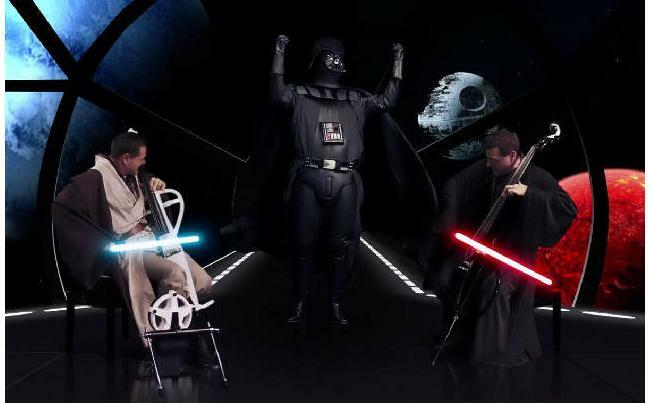 The perpetrators of this strange cello duel are two fanboys with an avowed admiration for both George Lucas and John Williams. Catch the video after the jump. According to the available text, it took more than a month of preparation and shooting to complete the video, where two Jedi are unleashing their musical prowess with…lightsaber bows. Might have been cooler if Tiefighters and X Wings were blasting each othe rin the background. Oh yeah, Darth Vader makes a cameo appearance.